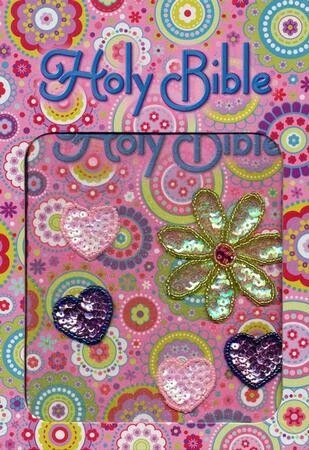 A fun sparkly and shiny Bible for little girls embellished with sequins…Cute to carry and easy to read! A full sized Bible in the International Children’s Bible® translation, the Bible kids can read and understand! This adorable Bible is bound in floral fabric and embellished with shiny sparkly sequins! The cover will invite other little girls to ask “what kind of Bible is that?” and the owner can show her sparkly shiny Bible, thus sharing the “light” of Jesus. Inside, the Bible will have four sweet full color presentation pages in the front, a dictionary/concordance in the back, and the full texts of the Old and New Testaments. Now your little girl can enjoy having a fun sparkly Bible to take to church and Sunday School.